The Philadelphia Phillies head to Turner Field on Saturday, September 23, 2017 to take on the Atlanta Braves. The expected starting pitchers are Henderson Alvarez for the Phillies and Julio Teheran for the Braves. The odds for this matchup have Philadelphia at +167 and Atlanta at -177. The Phillies have a 68-71-14 over/under mark and a 85-68-0 run line record. The Braves are 77-74-0 against the run line and have a 77-69-5 over/under record. The Phillies have a 61-92 overall record this season. Starting pitcher Henderson Alvarez has a 0-1 record with an earned run average of 7.20 and a WHIP of 1.20. He has 4 strikeouts over his 5 innings pitched and he's given up 4 hits. He allows 7.2 hits per 9 innings and he has a FIP of 7.95. The bullpen has an earned run average of 4.29 and they have given up 509 base hits on the year. Teams are hitting .252 against the bullpen and they've struck out 507 hitters and walked 209 batters. As a team, Philadelphia allows 9.2 hits per nine innings while striking out 8.1 batters per nine innings. They are 21st in the league in team earned run average at 4.63. The Phillies pitchers collectively have given up 1,397 base hits and 700 earned runs. They have allowed 212 home runs this season, ranking them 6th in the league. Philadelphia as a pitching staff has walked 491 batters and struck out 1,230. They have walked 3.2 men per 9 innings while striking out 8.1 per 9. They have a team WHIP of 1.39 and their FIP as a unit is 4.58. As a team Philadelphia is hitting .250, good for 20th in the league. The Phillies hold a .411 team slugging percentage and an on-base percentage of .314, which is good for 25th in baseball. They rank 19th in MLB with 8.6 hits per game. Cesar Hernandez is hitting .291 with an on-base percentage of .363. He has 141 hits this season in 484 at bats with 31 runs batted in. He has a slugging percentage of .417 and an OPS+ of 108. Freddy Galvis is hitting .255 this year and he has an on-base percentage of .306. He has totaled 149 hits and he has driven in 61 men in 584 at bats. His OPS+ is 83 while his slugging percentage is at .385. The Phillies have 1,312 hits, including 274 doubles and 166 home runs. Philadelphia has walked 456 times so far this season and they have struck out 1,336 times as a unit. They have left 1,017 men on base and have a team OPS of .725. They score 4.25 runs per contest and have scored a total of 651 runs this year. Atlanta has a 68-83 overall mark this year. With an earned run average of 4.52, Julio Teheran has a 11-12 record and a 1.36 WHIP. He has 143 strikeouts over the 175.1 innings he's pitched. He's also given up 171 hits. He allows 8.8 hits per nine innings and his FIP stands at 5.03. The bullpen has an earned run average of 4.67 and they have given up 458 base hits on the year. Teams are hitting .241 against the Braves bullpen. Their relievers have struck out 466 batters and walked 209 opposing hitters. As a team, Atlanta allows 9.1 hits per nine innings while striking out 7.8 batters per nine innings. They are 25th in the league in team earned run average at 4.78. The Braves pitchers as a team have surrendered 1,364 base knocks and 716 earned runs this season. They have given up 184 home runs this year, which ranks 17th in Major League Baseball. Atlanta as a staff has walked 546 hitters and struck out 1,168 batters. They give up a walk 3.6 times per 9 innings while they strike out 7.8 per 9. Their team WHIP is 1.42 while their FIP as a staff is 4.56. As a team, they are batting .263, good for 6th in the league. The Braves hold a .414 team slugging percentage and an on-base percentage of .326, which is good for 16th in baseball. They rank 8th in MLB with 9.1 hits per contest. Ender Inciarte comes into this matchup batting .304 with an OBP of .348. He has 191 hits this year along with 56 RBI in 629 AB's. He maintains a slugging percentage of .409 with an OPS+ of 100. Nick Markakis is hitting .274 this season and he has an OBP of .354. He has collected 152 hits in 554 at bats while driving in 69 runs. He has an OPS+ of 97 and a slugging percentage of .388. The Braves as a team have 1,371 base knocks, including 271 doubles and 155 home runs. 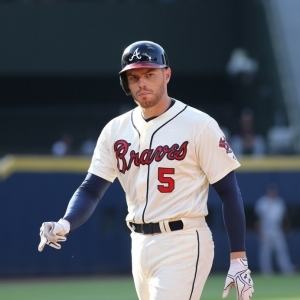 Atlanta has walked 436 times this season and they have struck out 1,114 times. They have had 1,041 runners left on base and have an OPS of .739. They have scored 4.57 runs per contest and totaled 690 runs this season. Who will win tonight's Phillies/Braves MLB game against the spread?